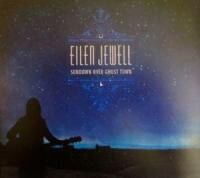 Eilen Jewell continues refining her poetic lyricism and songcraft on her fifth studio LP. Calling Eilen Jewell a poet rather than a singer-songwriter makes a certain amount of sense. Her lyrics on Sundown Over Ghost Town stand out for their expressive grace and and imagery. Jewell relies on her senses to sharply capture the essence of a person, place, or situation so that her narratives become concrete in their abstraction. For her, a train is “an iron wind”, the heaven above “a mocking blue sky”, and the sound of sweetness “the summer’s sprinkler turning on / the endless ice cream song”. You can feel, see, and hear what she’s saying. She offers barbed details, like a place that’s “just one horse shy of being a one-horse town” and has “seven bars and one church” to locate rural values and dreams. The only stars there, she notes, are not famous people but those endless bright lights in the night “that would take days to count.” The intentional ambiguity would make William Empson smile. As evocative as Jewell’s language is, not paying proper attention to her creative melodies and rhythms would be shameful on the part of the listener. Her melodies create sonic landscapes, mostly of the mythic American West where human beings have the perspective of big open spaces to compare themselves with. Jewell sings in a plain voice with a slight raspiness. This makes her sound experienced but not jaded. She plays acoustic guitar without affections and lets her band fill in the blank spaces. Jake Hoffman on pedal steel guitar picking in particular creates a sense of heartfelt emotion and physical distance, country western style. Jason Beek’s drum and percussion work keep the tempos moving like a steady semi-truck that moves through the landscape like a phantom in the night. The aural size of the music places allows individuals and their problems to be both big and small at the same time." When there are not many people / everyone matters and nothing does." Jewell compares herself to a “Half-Broke Horse” that’s not at home in the wild or on a ranch. It’s an apt metaphor for many of the personae on the album; they don’t fit in no matter how they try. Sometimes that’s a good thing, because being different makes her characters special. Jewell sings a sweet love song called “Worried Mind”, which takes its title from the choral phrase, “You ease my worried mind”. She knows her beau accepts her for who she is, which is poor and dissatisfied with life. His love and approval for her curmudgeonly self ironically makes her happy. The instrumentation gives Jewell’s unadorned vocals a wide-screen setting. This allows her to elegiacally philosophize, using descriptions of common rustic sites like “a lucky horseshoe in a pile of junk” and “a hot rod decaying in the thorns and the weeds” to represent “Some Things Weren’t Meant to Be”. This gives Jewell license to sing about dollar bills as “great green hills”, and say that she wears “bad luck boots” and engage in other word play that evokes poetry more than song lyrics. The music sets the words off, like the Milky Way on a dark black night. The wonder isn’t just that we are part of the star dust, but that there’s so much emptiness out there for our world to exist.